Shoreline algae scums have been occurring intermittently at Green Lake over the last few weeks. Samples collected on Jan. 2, Jan. 12, and Feb. 6 were sent to the King County DNR. Only some types of algae can produce toxins, but they don’t always. KC DNR forwarded potentially toxic samples to a lab to measure concentrations. Result: The Jan. 2 sample had 64 mcg/liter of a liver toxin, microcystin. Samples collected on Jan. 12 and Feb. 6 had less than 6 mcg/liter, the state guideline for microcystin in recreational waters. The Feb 6 sample also was tested for the neurotoxin, anatoxin a, but the result was non-detect (less than the guideline). What should/can we do about this? 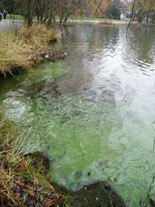 Report the algae scum to Friends of Green Lake (206-525-1974). If you can, get a photo and identify the specific location. FOGL will collect a sample and take it to DNR for ID and testing. Or you can contact Sally Abella of King County DNR at 206-296-8382. And my personal recommendation is if you see a green film on the water, keep the kids and dogs away from it. Don’t let your child or your dog have contact with the scum, nearby water or shoreline. The blackbirds have returned from their winter migration, and they are ready to set up nesting territories. The last couple of years, they have not nested at Green Lake. See printable flyer, BLACKBIRD MISSING. Lets get this work done, and encourage them to come home to Green Lake to raise their families! To volunteer, send an email to FriendsofGL@gmail.com. Volunteers are needed not only for the “dirty-work” of pulling out blackberry rootwads, and digging holes to plant new shrubs, but also for less energetic activities like taking photos and gathering debris into piles. This site is a steep bank extending to the cat-tail patch in the Lake. A few adventurous volunteers can borrow hip-boots to remove blackberries growing in the cat-tails. Next, we’ll start planting native plant species to keep people and dogs away from the nesting areas. This is the same steep bank we worked on on Oct. 2, 2010 (see photos). After cutting the blackberries down to the ground, and hauling the vegetation to the Parks Department truck, the hard-working volunteers hacked and dug out roots to reduce re-growth. We greatly appreciate all the hard work our many volunteers have donated to improve Green Lake’s shoreline habitat.